It is a beautiful Monday morning. I think Spring may have finally arrived. There have been no new book purchases since last week (this makes my wallet happy), but I did receive a Goodreads prize from Penguin Canada. 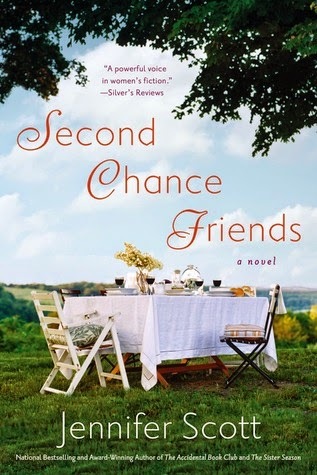 I won Second Chance Friends by Jennifer Scott. The book is about four women from different paths who somehow meet each other at an extraordinary crossroads. I'm a fan of character centric stories so, this sounds like one I will enjoy. The book's release date is not until next month so, I'll be adding it to my May TBR. As for what I read last week, both of the books I got through were ones that I loved. How to Love by Katie Cotugno was a cute story about young, vulnerable love and the heartbreak that sometimes usually goes along with it. The Mountain Story by Lori Lansens was a story of survival, perseverance and redemption. This one is a keeper for me. I cannot wait to mee Lori Lansens next week! I had originally started last week reading The Night Stages by Jane Urquhart, but had to put it down because I just couldn't get into it. I'm going to give it another go this week, but I fear it may end up in my DNF pile. I have also started The Man Who Learned to Walk Three Times: A Memoir by Peter Kavanagh. What do you have on deck this week? Hi! Thanks for the follow! I want to follow buy I can't add you because I've already reached my limit, if you add the button to your blog I will be able to! Thank you for the tip! I added the button :) Cheers! Thank you for your kind words and the following. Looking forward to reading more of your reviews.